2017 marks the 60th anniversary of the opening of formal diplomatic relations between Ireland and Japan. Over the last year DIFP has been exploring the sixty years since 1957. Later this year we will publish the first account of diplomatic, economic and cultural relations between Ireland and Japan. Japan was the first east-Asian country with which Ireland established diplomatic links. 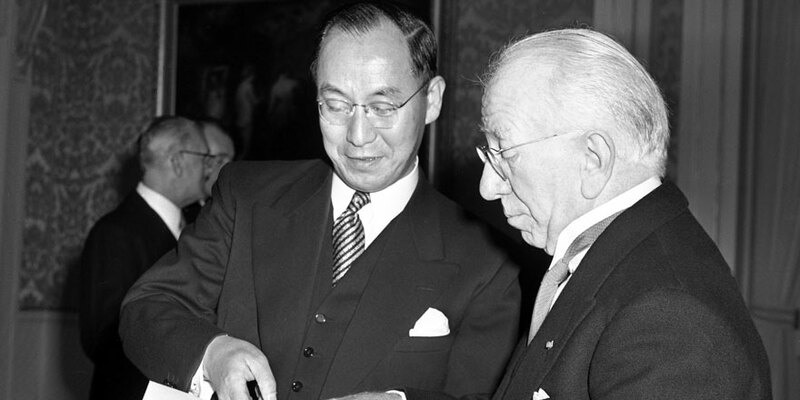 Japan’s first Minister Plenipotentiary to Ireland, Akira Ohye, presented his credentials to President of Ireland Seán T. Ó Ceallaigh at Áras an Uachtaráin in October 1957. Only in September 1973 did Ireland’s first Ambassador to Japan, Robin Fogarty, present his credentials to Emperor Hirohito. Yet even by 1957 connections between the two countries had already existed for almost a century. Following the Meiji Restoration, Irish men and women emigrated to Japan, making their mark in a variety of fields and, especially in the case of Lafcadio Hearn/Yakumo Koizumi, forging cultural connections that have endured. In the opposite direction the arrival of the Iwakura Mission in Ireland in December 1872 was a symbolically significant moment in the development of relations between the two countries. Though separated by a distance of almost 10,000 kilometres, both countries face similar challenges. At the United Nations, which Ireland and Japan joined in 1955 and 1956 respectively, both states strive for global disarmament and nuclear non-proliferation, whilst bilateral economic, trade and cultural links continue to develop each year. Ireland and Japan both rely on the establishment and maintenance of strong diplomatic, trade and economic relations to develop and sustain their independence in an increasingly globalised world. The booklet will focus on how since the early 1970s trade and business relations between Ireland and Japan have developed and grown. Cultural relations have strengthened immensely, helped on by high-level visits including those of President Patrick Hillery to Japan in 1983 and Crown Prince Akihito and Crown Princess Michiko to Ireland in 1985. In the early twenty-first century common links between Ireland and Japan include a shared commitment to democracy, human rights, freedom and justice, peace, the rule of law, and the eradication of poverty. The future of the relationship between Ireland and Japan is strong, and rests on the solid foundations of a shared history that, as we have discovered in recent months, is rich, vivid, and often surprising. Image: Japan’s first Minister Plenipotentiary to Ireland, Akira Ohye, with President of Ireland Seán T. Ó Ceallaigh after presenting his credentials to the President at Áras an Uachtaráin, Dublin, 31 October 1957. (Image courtesy of irishphotoarchive.ie/Lensmen collection).